I have to wonder why ASUS produced the RT-N65U. With its ever-popular RT-N56U covering the N600 bases and RT-N66U taking top honors for N900 class routers, why bother with the odd-man-out N750 class? Sure, N750's were fine in the days before 3x3 chipsets for both 2.4 and 5 GHz bands were readily available. 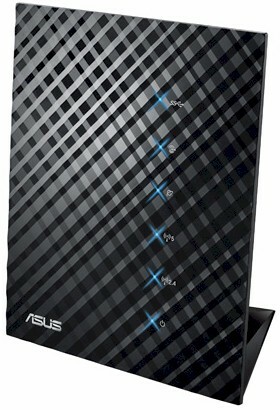 But now that they are plentiful, why would anyone opt for an N750 router? But I come to review the N65U, not to dis it, although we'll see that ASUS has given us reasons to do that. I also have to apologize for the tardiness of this review. ASUS pitched the N65U for review last July, but I passed for the reasons above. When I changed my mind toward the end of 2012, ASUS told me they wanted to hold off for a firmware update that had AiCloud enhancements. After a few months passed still no router appeared, I had to threaten to buy one myself to review it because ASUS still wanted to hold it, pending a firmware upgrade. When the router finally arrived, it got caught in the transition to our new wireless test process, which caused a few more months delay. You would easily mistake the N65U for the N56U, starting with its dyslexic-baiting model number. I'm sure I will screw up between the two in the course of this review. So please don't hesitate to call me out for any errors you catch. Both routers are physically almost the same size (the N65U is 5 mm narrower) and have the same glossy "black diamond" pattern on their front surface. The callout diagram below shows you get the same vertical format, same front panel indicators and same Gigabit WAN (1) and switched LAN (4) ports. A key difference between the two products, besides the different wireless class, is the N65U's dual USB 3.0 ports vs. the N56U's dual USB 2.0 ports. The N65U's USB ports are down next to the power port vs. sandwiched between the WAN and LAN ports on the N56U. Another thing the N65U has in common with its N600 cousin is its Ralink-based (now MediaTek) design, which is obvious from the board shot below, taken from the FCC ID docs. The gallery has a few more pictures of the N65U's innards, which employ a large heatsink that stretches across all the key components to try to keep things cool. Like the N56U, all of the N65U's five three antennas are printed directly on the circuit board. The 5 GHz radio, which is a 3x3 design (N450 class) supporting link rates up to 450 Mbps gets three. The 2.4 GHz 2x2 radio, with its maximum 300 Mbps link rate (N300 class) gets two. Both radios feed into the three antennas, two of which are dual-band. Key components for both products are summarized in Table 1. The only other component of note not in the table is the Asmedia ASM1042 USB 3.0 host controller that provides the dual USB 3.0 ports. Circuit-side view of the board. This is the side that faces the front of the router. 16 MB of flash is visible. Heatsink removed. You can see the RF shields and the thermal pads that couple them to the heatsink.